Braga, Portugal — A international collaboration, including INL researchers – Jose Lado (ETH, Zurich), Alejandro Ferrón (CONYCET, Argentina) and Joaquín Rossier ( Theory of Quantum Nanostructures Group Leader at INL) – , have made a major scientific breakthrough by detecting the nuclear magnetism, or “nuclear spin” of a single atom. The experiments have been carried out by IBM Research at Almaden (California), in collaboration with the University of Oxford and QNS (Seoul). 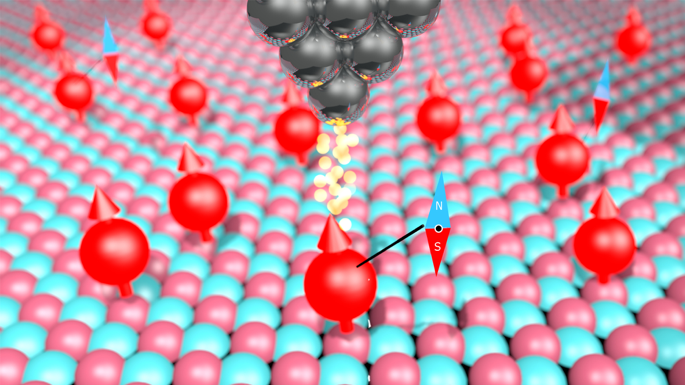 The researchers used advanced and novel techniques to measure the nuclear spin of individual atoms on surfaces for the first time. Normally the nuclear spin, which describes the magnetism of the atom’s core, can only be detected in very large numbers. The findings, published today in the journal Science, show that this is now also possible for single atoms on a surface. To do that the team used a Scanning Tunneling Microscope, which consists of an atomically sharp metal tip and allows researchers to image and probe single atoms. The two elements that were investigated in this work, iron and titanium, are atoms that can have a different number of neutrons in the atom’s core, these are the so-called isotopes. Only certain isotopes of each element have a core with a nuclear spin. It is normally exceedingly hard to measure nuclear spins of individual atoms. Traditionally large numbers of nuclear spins are required, making this advancement so noteworthy. In the longer term, this could be used to store quantum information in the atom’s nuclear spin, that combined with the capability of scanning tunneling microscope to build structures atom by atom could help to fabricate small quantum computers. While still in early development, quantum computation promises to vastly outperform classical computers in tasks such as database management, search, and simulation. Sketch of the setup. Single atoms are deposited on a surface of magnesium oxide. Some atoms naturally have a nuclear spin, a small magnet, in their core. They are imaged by the tip of a scanning tunneling microscope which also allows researchers to probe their electronic configuration.